Belsay Hall Photographed in the Spring . Image from English Heritage Guidebook. As an artist I am looking, living, imagining, experiencing and making. These are all aspects of my work but I never think of any of it as work. It’s just my life, it’s what I do. This summer was an exceptionally busy one but I am so glad that despite being busy I was able to visit Extraordinary Measures at Belsay Hall (near Newcastle on Tyne). Last year I had some mentoring sessions with Freddie Robins. We talked about the difficulties of working in textiles but still wanting to make site specific work to be sited outdoors. Freddie is one of the artists who was selected to exhibit in this year’s exhibition at Belsay Hall. Judith King curated this show and it features some very big names in the contemporary art world. 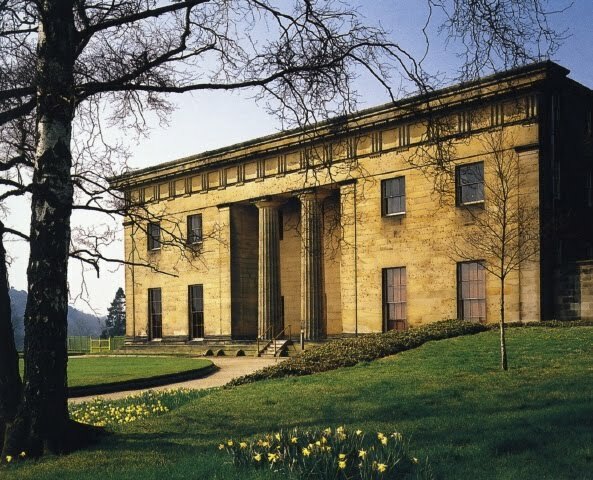 This is the 6th year that Belsay Hall has hosted a summer long contemporary art exhibition and on the strength of Extraordinary Measures I will make it a must to return for future shows there. Belsay Hall was built by Sir Charles Monck (started in 1807and completed in 1871). He was obsessed by Greek architecture and owned every book published on the subject. The house is built from stone quarried just a ‘stone’s throw’ away and the most wonderful l thing about the house is that as a result of Sir Charles Monck’s passion/obsession it is actually built to very specific measurements and using the beautiful proportions of Greek architecture. While on his two year honeymoon (in Greece) Sir Charles had sketched and measured many Greek buildings and monuments. The Temple of Theseus in Athens (449-411BC) is said to be the direct inspiration for the columns on the entrance front of the Hall. The book cases in the library were even taken from measurements of another Greek building the Erechtheion (421-405BC) also in Athens. Sir Charles was meticulous and all the dimensions, proportions and masonry detail were calculated to three decimal places. It is also said that as a direct result of Sir Charles’s exacting standards the craftsmen working on the building of the house actually raised the standard of craftsmanship (particularly stonemasonry) in the North of England. Belsay Hall has been in the care of English heritage for 25 years now and when it came into their care it was with the proviso that it would be open to the public but shown in an unfurnished state. This is the perfect way to appreciate the proportions and also the quality of craftsmanship in the building of this unique Greek Revival style building. It is also a perfect back drop for contemporary art. It is an amazing non-gallery setting. Since 1996 there have been 6 exhibitions but for this most recent one I feel that Curator Judith King has done an incredible job; not only in selecting the artists for Extraordinary Measures but also for encouraging them to make works which are displayed in such a variety of spaces at Belsay. Artworks have been sited in the Hall, the quarry gardens, the castle and even the dog kennels. Several Ron Mueck sculptures are installed within the hall. I was particularly struck by Wild Man which is placed in the library. 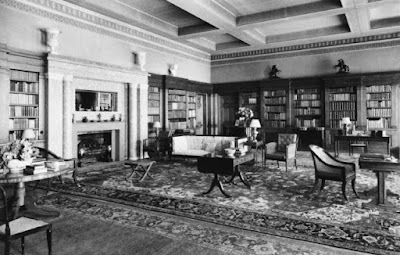 Here's an image of the library as it was when photographed for Country Life magazine in 1940.
and now what a difference. Here the library is inhabited by Ron Mueck’s ‘Wild Man’. This image from Denise at The Swelle Life blog. I was glad to have the chance to watch the video about Ron Mueck and his working methods. It was really illuminating. Slinkachu is an artist who I had always associated with working in urban spaces. I think he rose to the challenge really well. A fag end monolith? It was a drizzly damp day but wow! a really perfect one to experience the atmospheric delights of Belsay Quarry Gardens. I think the quarry gardens really have to be experienced to be appreciated but hopefully the following photos will give you a feel for it. We walked past the croquet lawn (which immediately set off Queen of Hearts images in my brain). We passed this strangely trimmed bush. A strange beast which might pounce at any second? But no this is Belsay House in Northumberland and not the Isle of Wight where I spotted this little treasure! I found Tessa Farmer's mutated grey squirrels all a bit too nasty for my taste. But interesting to see how after months in the weather the cases had cobwebs and condensation in them making the scenes even more sinister. Freddie Robins found a dark little cave where she installed her exquisite little knitted robins for 'Woodland Unhappy Families'. They were portraying the Greek myth of Theseus and Ariadne. There is a sense of loss on several levels: The loss of Ariadne’s life as she sacrificed it to save Theseus, the mourning for the seemingly more uncomplicated 1950’s where families sat together in cosy living rooms playing board games together and even the loss of several inches of red knitted robin’s breast. We came across Ciaran Treanor’s 'Wild Horses' on this grassy area at the back of Belsay Castle and by the dog kennels. Back at the beginning of this exhibition there were spring bulbs in bloom, tulips and daffodils sprouting around the horses' hooves. I like seeing the journey through the seasons since the show’s opening in the spring of this year but I think that the 'Wild Horses' seems much more at home in this long late summer grass. Another thought on site specific work and how seasons and time affect not only the art but also the site… . And inside the castle (where the family lived before the hall was built)…this is where the ‘Scalesdale’ project is exhibited. This is a piece by local architects practice MGA and modelmaker Pete Young and which has grown and evolved over the months of the exhibition. The way that the work has grown has been affected by decisions made by visitors. This work is specifically to show how our environments are moulded depending on our choices about power sources, amenities and roads etc. Upstairs in the Great Chamber is the wonderful spectacle of Matt Collishaw’s ‘The Garden of Unearthly Delights’. It is amazing and has to be seen to be believed. Photographs were not allowed but here’s another from Denise at The Swelle Life blog. This absolutely amazing zoetrope is a thing that you need to spend time with and watch mesmerised for minute after minute. I would love to know more about how it was made and how much, if any, of the hands on making that Matt Collishaw did? The concept is genius but the execution is just as impressive in my opinion. I do know that he has already sold it to his friend Damien Hurst for £140, 000. For me Mariele Neudecker’s contribution to Extraordinary Measures completely stole the show. We encountered her piece, ‘From Here to There is Not That Far’ in the quarry gardens. Again, although I had seen an image of the piece nothing can really prepare you for that physical encounter. It is a piece of art that I am still experiencing now and I expect that it is something that I will continue to re-experience in my memory for months… even years to come. back slightly smaller than you would expect. At first you are so wowed by the size of this huge window; so taken by the perfect oddness of its setting in between two high rock ledges. But then once you start to notice your reflection it is very much about how you are interacting with the art. I feel that this is a perfect example of a piece of art touching all the senses. I never actually touched the glass with my hands but I still feel completely touched by the experience. Touched is the title of the Liverpool Biennial 2010. I attended the Touched conference last Saturday. Much was said about Touch, how art touches, and all the other senses that we draw on when we experience the sense of touch. So seeing this piece, walking through it, walking round it, feeling how it related to the space in the Quarry Garden these all were key ingredients of my experience of Touch….really perfect. Thank you Mariele Neudecker. Extraordinary Measures is an exhibition which is mainly about scale. Mariele Neudecker’s is the most monumental in size and Freddie Robins’ is on a much smaller scale but proves how much small works are just as able to touch on so many levels. I realise now, looking back at the images of Freddie Robins’ ‘Woodland Unhappy Families’ that only someone who has had the experience of unravelling a piece of knitting will understand the FEEL… both physical and emotional… of the strange rippling sensation felt through the yarn as the stitches are unravelled. Thanks to Steven Connor’s wonderful, insightful and illuminating talk at the Touched conference I am now experiencing Freddie’s piece on a much deeper level…. Feeling through, my own physical knowledge and memories of touch I am able to feel touched by ‘Unhappy Woodland Families’ on a level that is made possible by my own personal connections that I have made between the physical feeling of unravelling knitting and the emotional feeling of loss that I have associated with it. Extraordinary Measures continues at Belsay Hall, Castle and Gardens until Saturday 25th September. Get there by 3pm on Saturday and have three wonderfully life enhancing hours.